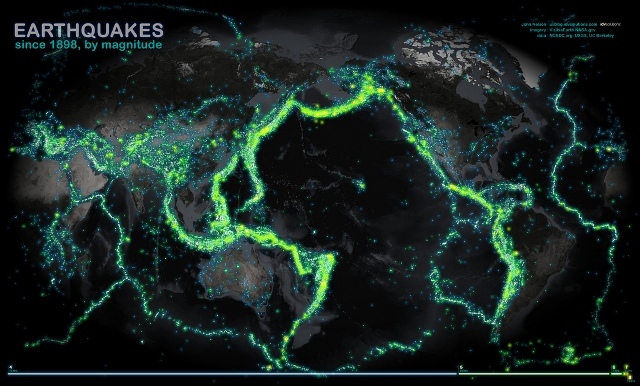 This post shows off a very cool image of global earthquakes since 1898. No link to the source dataset, though. That's unfortunate, because it would be really cool to see this as an animation, and as a KML file (with timestamps, to allow temporal scrolling). Hmmm... sounds like a job for JEQL. Update: the post does give a link to ANSS, which has a service making the data available in a variety of formats, including KML. It doesn't have a timestamp for temporal scrolling, however - and perhaps a different way of styling might be interesting. A heatmap, perhaps?